“Put it in the books” is the catchphrase of New York Mets’ radio announcer Howie Rose after the final out in a Mets’ victory. In baseball, unlike in most things in life, there are clear measurements of success in a game or over the course of a season. The final score? Number of wins? Did you make the Playoffs? The World Series? Well, what about camps? There are some quantitative measures, like camper return rates (and we are thrilled that Scatico’s exceeded 90 percent by October 1). We also appreciate the feedback provided by so many staff and campers who returned their 2016 surveys (still time to send back yours!) as well as the many nice letters and emails received from parents. Opening tip of the girls' Nat Holman Basketball Tournament (Kasey showing some hops). But beyond these tangible assessments (numbers to review, surveys and letters to read), the true measure of the value of a Scatico summer (and any camp experience) ideally makes itself apparent in how we live our day-to-day lives—skills learned (at activities or in group living), friendships formed, memories created, values fostered, and even challenges overcome. Oftentimes, the real impact (beyond just having fun) doesn’t immediately reveal itself, but emerges over time, is cumulative and seemingly never-ending. What are those experiences in your life that most positively shape the person you are and strive to be? So though the summer of 2016 may be forever “in the books,” we trust it will be a book that gets re-read and embraced over and over for many years to come. Lowe Hill Soccer League (Oz zeroing in on the ball). Welcome to the first “Wha’s Happenin’ ?” column of the 2016-17 off-season. As always, we’ll start with Random Scatico Sightings (RSSes)…. First of the off-season? On a postcamp family cruise aboard The Anthem of the Seas to New England and Canada, Noah Wagner spotted Nile Cather and sent in the photo to the right…. When coming off the field after trying out for teams in his flag football league in Manhattan in early September, Irwin Schwartz ran into Emmett Miller (who, a grade older, was getting set to try out for teams in his league)…. Attending the Mets’ wildcard playoff game, boys head counselor Cory Schwartz and cousins Jeff and Ethan Rosenberg had an RSS with fellow Mets fan and 2016 Upper Senior Ryan Ditkoff…. And, a final (slightly dated) RSS (although Scatico news is timeless), brothers Jon and Matt Gross met up with Josh Trichon at The Belmont Stakes in June. Three weeks later, Jon and Josh (former bunkmates) were co-counselors in the Sub-Juniors…. In other Scatico news (and thanks to the Gross boys for providing a lot lot of copy!) fellow 2016 CITs Matt Gross and Marissa Stone met at the Penn State versus Michigan University football game in Ann Arbor. Marissa, a Michigan native, is a Wolverine fan; the Gross family’s Penn State roots span multiple generations. (If you’re wondering about the score, Michigan added to its all-time best win total in college football)… Jon Gross, a student at Penn State (surprise!) is continuing to pursue his passion for sports broadcast journalism. This fall, he’ll be doing radio play-by-play for the women’s volleyball team, which last season advanced into the third round of the NCAA Division I tournament…. Congratulations to Eden Miller, who returned from camp just in time to welcome to the world her new baby sister Drew… Ten of 16 Jinters came together in September at The Treat House in New York City for a joint birthday celebration for Parker Caldara, Sarah Moyal, Alexa Tannenbaum, and Eden Miller…. Assistant music head on boys side, CJ Ditkoff, performed at many Scatico events this past summer, including campfires, the 4th of July Talent Show, and Open Mic night. His first EP album is available online at cjseabear.bandcamp.com/releases. CJ wrote all of the music and lyrics for the album, sings all of the lyrics, and plays all of the instruments (other than adding drums in one song)…. And, saving the best three news items for last... Sarah Feldman was so inspired by this summer’s service trip to run a day camp for underserved children in the Dominican Republic, that she is hosting a small fundraiser at her high school in Cheshire, CT, to send books and school supplies to the hosting organization, the DREAM Project…. For his Bar Mitzvah project, Ryan Derasse is collecting items and money for the Cove Animal Rescue Shelter (where his family has adopted 3 cats). The first family to donate? The Chaits (2016 one-week camper Zach with his parents and sister), who were at the Rosh Hashanah services when the project was announced. Moms Katie Mazarin Derasse and Dori Popkin Chait were both Scatico campers in the 1980s and 1990s….. And another fall shout-out to the Wilner sisters—Kasey and Sam—who with their parents have again helped organize a “Scatico” team to help raise money for the Charley’s Fund’s “Race Against Time” (October 16th in Central Park). The charity works towards finding a treatment and cure for Duchenne muscular dystrophy. For more information, contact Ellen Wilner (mom of Kasey and Sam) at ellennfwilner@gmail.com. Thanks for staying in touch! Send news, non-news, and photos (and nonphotos?) for the Winter issue of the Camper Newsletter to info@scatico.com. As a reminder, we only include info on Scatico get-togethers if the entire division is invited. Last night of camp blues? You may not be able to recreate fully the banquet, awards ceremony, and campfire at home, but you can watch the closing-night Slideshow and Video Yearbook. Dim the room lights and pretend you’re lying on the Pavilion floor…. A few of the many special events only seen during a certain 4 days towards the end of the summer. Above– Girls Color War Sing and Bucket Brigade. Below– Boys Boating Regata. Thanks to all of our families who took advantage of the early enrollment discount period. Our camper return rate for 2017 already exceeds 90 percent (including 5 divisions with 100 percent returns). Parent Bulletins starting in November will walk you through the process of getting ready for the summer, but don’t hesitate to contact us directly with any questions along the way. Finally, if you are ever in the Elizaville area during the off-season and are thinking of stopping by camp, campers love seeing their second home during different seasons—fall foliage ringing the lake or along the treelined road; snow on the golf course for sledding… Just call or email when you’d like to make the trip. The 4th of July in Elizaville…. is always one of the best nights of the summer. Evening activity starts with a full-camp BBQ, to be followed by the annual Talent Show, and ends with divisions sitting together on the Golf Course (red-white-and-blue popsicles in hand) to watch a fireworks display. 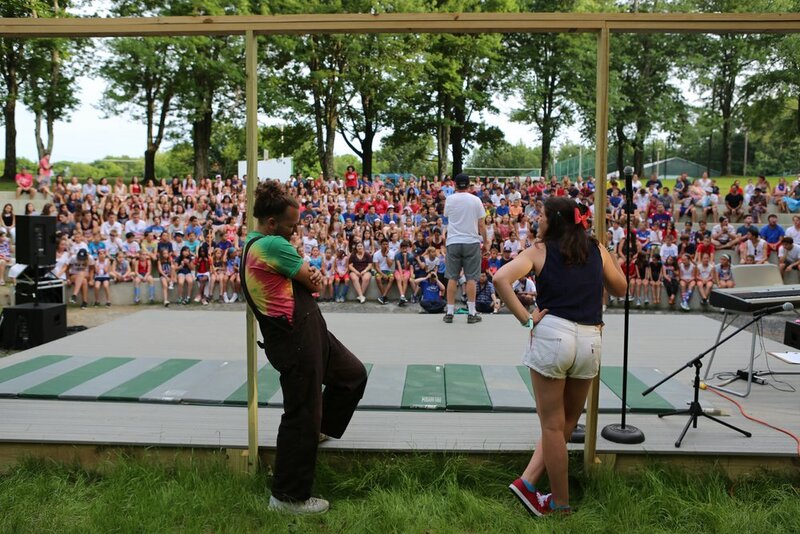 Above—Jake and Jane get set to host the 2016 July 4th talent show, the first fullcamp event at the new amphitheater. The Centers are ready for the night sky to light up. Survey Results: This is a last call for camper and staff surveys... Favorite meals? Activities? Things you like best about Scatico? Suggestions for 2017? If you haven’t returned your survey yet, there’s still time. News from Elizaville: We will bring you up to date on completed fall maintenance projects and capital plans for next season.